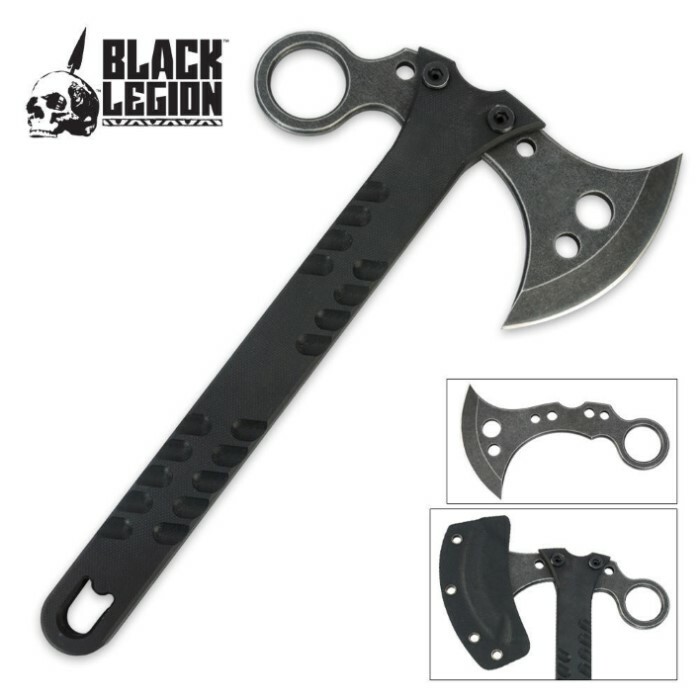 Get two tactical tools at one low price with this Black Legion stonewash steel axe. The handle can be removed, leaving you with a karambit-style blade complete with a thumb hole. The hefty steel construction has a modern stonewash finish, and the rugged G-10 handle is durable and built to last, providing a secure, slip-free grip. Includes a Kydex sheath. 3-1/2" sharpened blade; 6" head; 10" overall axe. This is a handy little hatchet. I said Hatchet! It is not an axe . 9.50 inches overall makes it a small hatchet if anything. Someone mis-labeled it. But, hey its cute. When I saw this axe up for sale, I immediately saw the versatility, being able to detach the head for more specific tasks (camping, work, etc). When it arrived, what surprised me was how solid it felt in hand, yet with a light feel for easy handling. 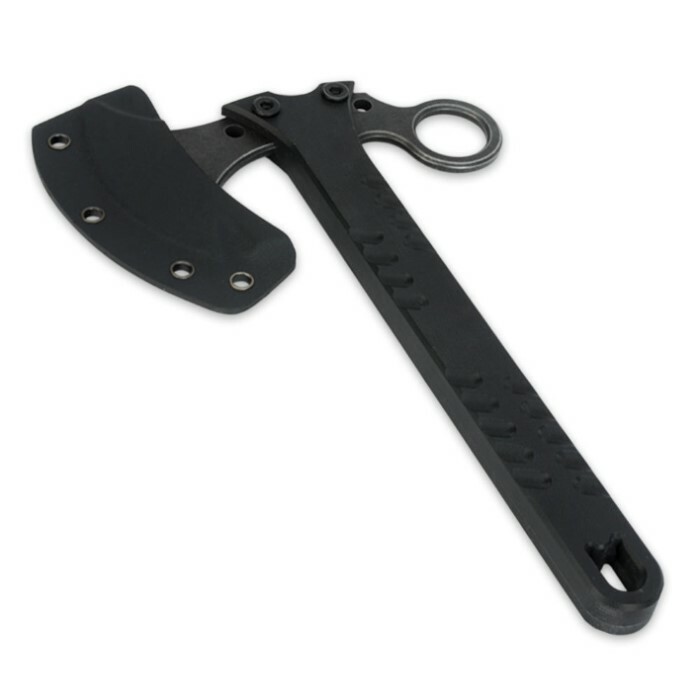 With its size, this axe makes a great minimalist addition for a backpack, truck/car, etc. From a self-defense standpoint, I see even more potential. I've tried it out around the house with backyard work and other cutting chores. For chopping small branches, it was perfect. Breaking down cardboard & cutting rope with the axe head (makes for a great karambit/utility cutter), terrific. While I don't believe this axe is meant for heavy-duty tasks, for quick jobs, it works for me. If space is an issue in your Bailout/Bugout Bag, being able to break this down to two pieces is fantastic, taking up very little room. Overall, I feel this is a great approach for an axe. At this price, I'll be buying a few. I do recommend this axe. Thanks, BUDK.